Knowing the location of the facial muscles and understanding that every patient is an individual with possible anatomical variations is key. In Dr. Perez’s opinion, there is no better injector than a surgeon with extreme knowledge of the facial anatomy obtained by the experience of performing surgery in this region of the face. BOTOX is one of the facial injectables used cosmetically to remove wrinkles and medically to treat certain muscular conditions. Botulism toxin type A injections such as BOTOX and Dysport have become one of the most popular cosmetic procedures due to their effectiveness and easy administration. Dr. Perez likes to spend up to 15 to 30 minutes with every patient on their first visit. At that time he will evaluate the patient’s needs and concerns as well as discuss the procedure including benefits and limitations. A typical BOTOX injection procedure with Dr. Perez usually takes about 20 minutes. First, the patient’s forehead and around the eye area will be cleansed with alcohol, removing all foundation and powder. This will allow for the area to be a clean surface for injection and promote better visualization of facial movements. Next, the patient is required to apply an ice pack to the facial areas. This allows for localized capillary vaso-constriction, decreasing the risks of bruising and bleeding and increasing comfort. As the patient applies the ice pack to the face, Dr. Perez prepares the BOTOX injections. BOTOX is packaged as a powder form in a small vial. This medication is required to be refrigerated. Upon use the medication must be mixed with 0.9% Normal Saline to become ready for injection. Dr. Perez believes patients benefit from a facial injectable such as BOTOX by receiving a freshly opened and freshly reconstituted vial of the medication. Therefore, at our office, Dr. Perez usually opens one bottle of 50 Units of BOTOX per patient and 100 Units when 2 or more patients are on the schedule within a 24 hour period. There are many studies showing BOTOX is still active for up to 2 weeks of being reconstituted, however the efficacy of the medication gradually decreases. You can rest assured that, at Renue Aesthetic Surgery, you are receiving the freshest BOTOX each time you get injected! Once the patient has iced for 5 to 10 minutes, Dr. Perez will then begin the injection. 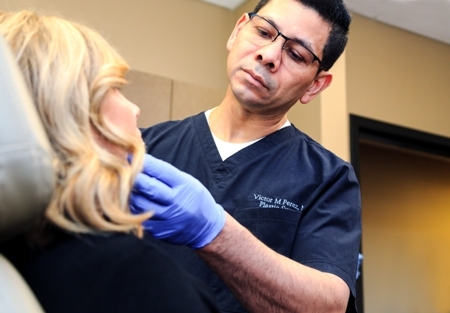 Dr. Perez uses a 32 or 33 gauge needle, the smallest needles available, which provides maximized injection comfort for the patient and reduces the risk of bleeding and bruising. First the muscles of the glabellar region are injected. Prior to the needle being inserted into the injection area, Dr. Perez uses a single ice cube in a zip-lock bag to numb the injection area again prior to placing the needle into the muscle. Many patients report that this 5 seconds of ice application not only acts as a distraction, but numbs the injection area and allows for even more vaso-constriction of tiny capillaries. Some patients report that the cold ice is more unpleasant than the actual injection itself. Following injection of the Glabellar area, Dr. Perez injects the peri-orbital area around the eye. Patients who suffer from Crow’s feet benefit from injection to this area. Many patients report that their fine lines and wrinkles completely disappear after a facial injectable. Others with deeper lines and wrinkles may benefit from skin care, fillers, or CO2 laser skin resurfacing for additional improvement. Dr. Perez continues the injections then across the forehead and finally finishing with injecting the upper aspect of the nose to decrease the “bunny nose“ wrinkles. Occasionally Dr. Perez will inject superficial muscles of the lip and neck to improve specific problems, and muscles of the lateral chin to elevate the corners of the mouth. Dr. Perez believes when all the muscle groups are injected in one treatment the effect is not only better, but usually lasts longer than the usual 3 to 4 months. This is because as a surgeon who does many surgeries in this area (i.e., blepharoplasties, forehead lifts, lateral brow lifts), Dr. Perez knows that there are several groups of muscles in the forehead area that work in harmony with each other. Some are elevator muscles (muscles that raise features) and others are depressor muscles (muscles that pull facial features down). Addressing these two forces simultaneously ensures the best possible results. As with any cosmetic procedure, there can be possible side effects. The most common can be headache, bruising and inflammation at the injection site. We encourage all patients to refrain from taking any aspirin, NSAIDs, or any other medications (including herbal) that may thin the blood for 7 to 10 prior to injection. Patients will leave the office usually with localized erythema at the injections sites that resolves in about 2 hours. Post procedure instructions and restrictions will be discussed as well. Call 913-685-1108 to discuss BOTOX and other non-surgical treatment options with Dr. Perez. Soft tissue fillers are minimally invasive procedures used to add volume to zones of facial depletion, as a result they improve the contours of the face and appearance of facial wrinkles, resulting in a fuller, smoother, and more youthful appearance. Good candidates for this procedure are patients with lines or wrinkles around the mouth, in the nasolabial folds and underneath the eyelids. Another common use of filler is to increase the size and enhance the shape of the lips. There are many types of fillers. The most commonly used are Juvederm and Restlyane. Both use hyaluronic acid, a substance that makes for one of the safest fillers because it is a normal component of our body’s soft tissue. Also this medication can be removed safely if there is an undesirable result with a substance called Hyaluronidase, which will digest the filler. Most ahyaluronic injections last between 9 months to 18 months. There are other fillers with the advantage of lasting longer, however Dr. Perez does not use those due to the fact that rarely some patients can develop lumpiness around those fillers (called granulomas) and those problems may require surgical excision. For patients looking for a more permanent effect, Dr. Perez believes that the best option is fat grafting. Dr. Perez believes in performing this procedure with dental blocks. This allows for the patient to tolerate the injection better and decreases the chances for bruising and bleeding due to the fact that patients who are comfortable their blood pressure is unlikely to go up in response to the treatment. Also, since the patient is more comfortable, the procedure is performed with more precision. Using ice and epinephrine there is vaso-constriction of the blood vessels, further decreasing the chances of side effects. A typical hyaluronic acid syringe holds about 1 cc of gel HA. Depending on the amount of correction needed, most patients will need between 1 to 3 syringes. The syringe of HA gel is injected using a fine needle that is inserted at an angle to the under portion of the skin. Certain injection techniques will be used to obtain certain volume results. As the gel is injected into the area of deficit, results are seen immediately. The effect of your injection will be visible immediately after your injection, but edema will set in 3 to 4 hours after. Expect some swelling, which usually subsides within 48 hours. In some patients this may last up to 2 weeks. Once all the edema is gone patients see the final results. Because of this, it is important to plan the date of the injection being sure to have enough time to recover. The application of cold compresses will help during the first 24 hours after the injection period. Then cold and heat can be used in an alternating fashion. Massage is also important and Dr. Perez will instruct you about the proper technique. It is important to stop any NSAIDs medications (Aspirin, Ibuprofen and Naproxen) 7 to 10 days before the injection. Also stop all herbal supplements such as fish oil, Vitamin E, 3 to 4 weeks before the injection, to decrease the chances of bruising or hematomas. The use of Arnica is favored by some practitioners to help increase healing time by decreasing inflammation and bruising. Dr. Perez has seen patients who are believers and those who are not, so he lets his patients decide if they wish to use this natural remedy post injection in a pill or fresh pineapple juice form. Contact Renue Aesthetic Surgery by calling 913-685-1108 to find the filler that's right for you.